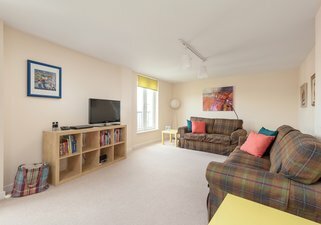 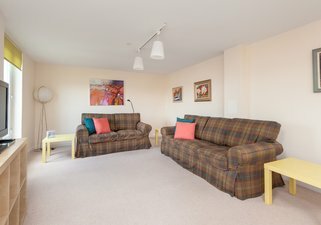 Tartan sofas and bespoke artwork delight the senses in the open plan kitchen and living room, complimented by neutral décor and large Juliet balconies, allowing plenty of light and fresh air in to the property. 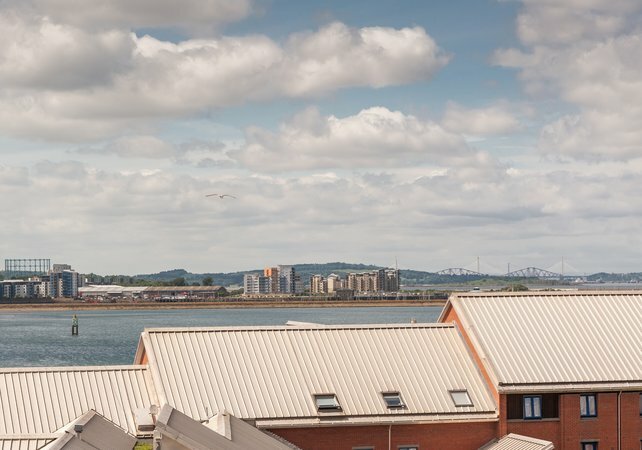 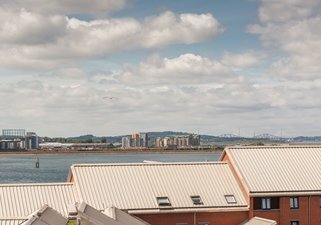 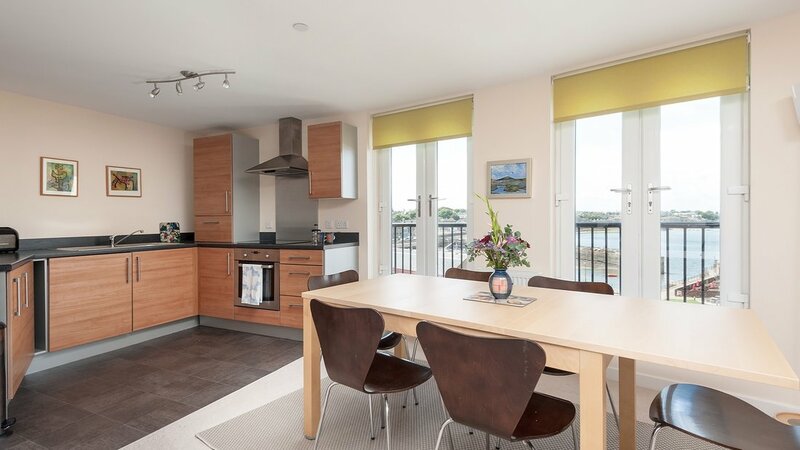 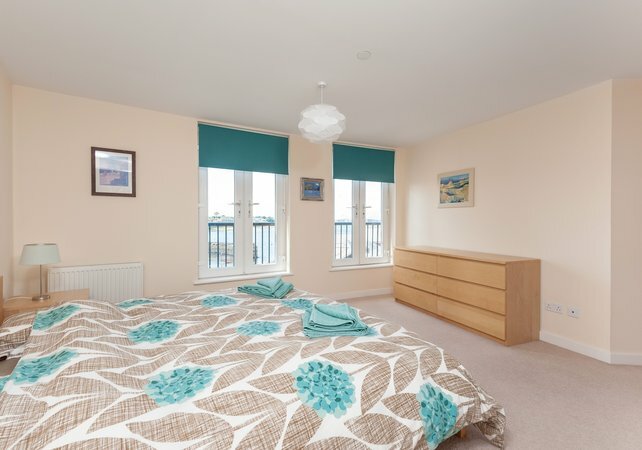 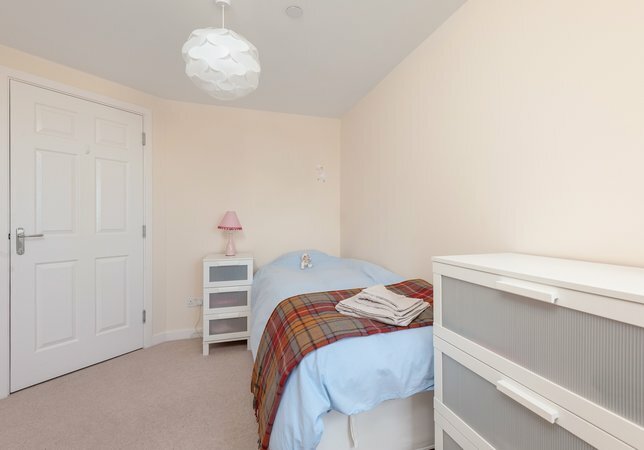 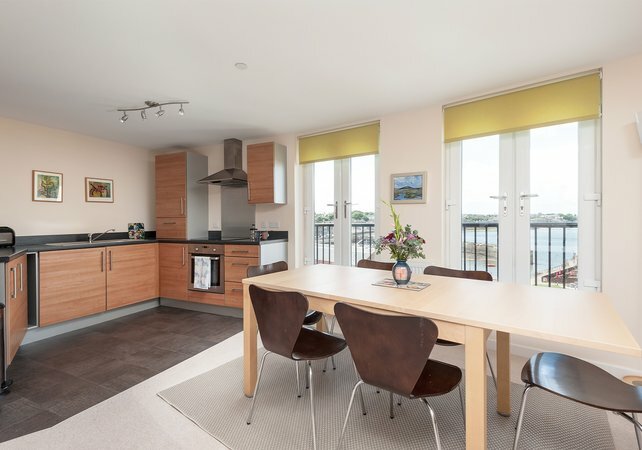 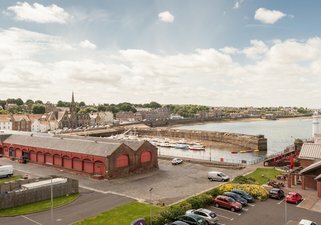 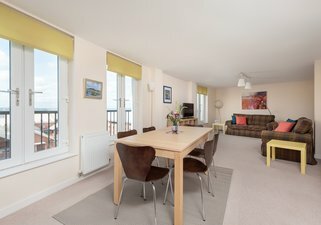 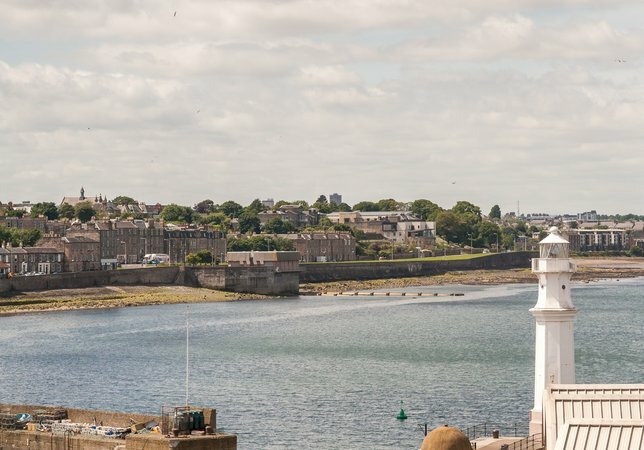 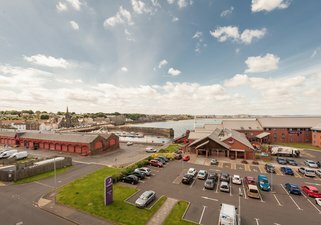 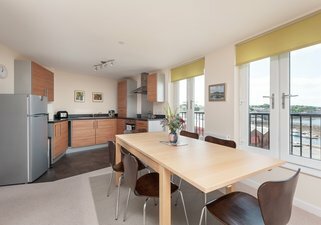 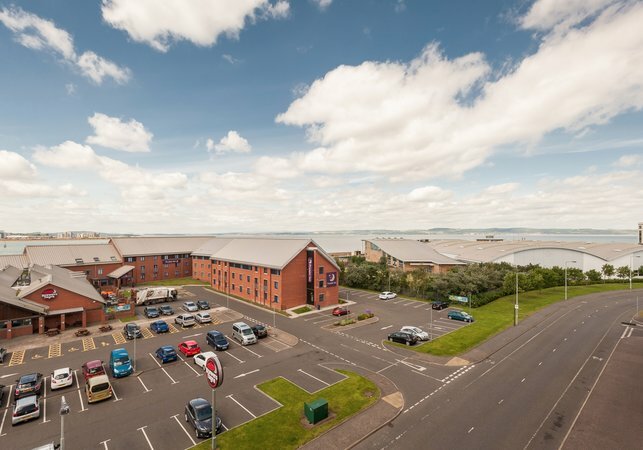 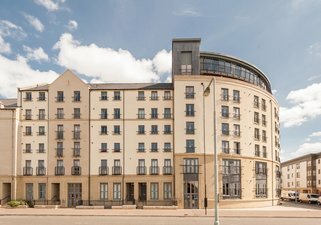 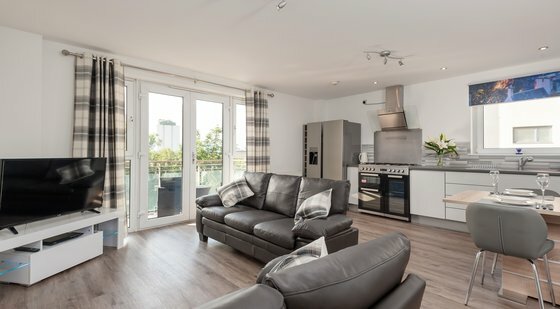 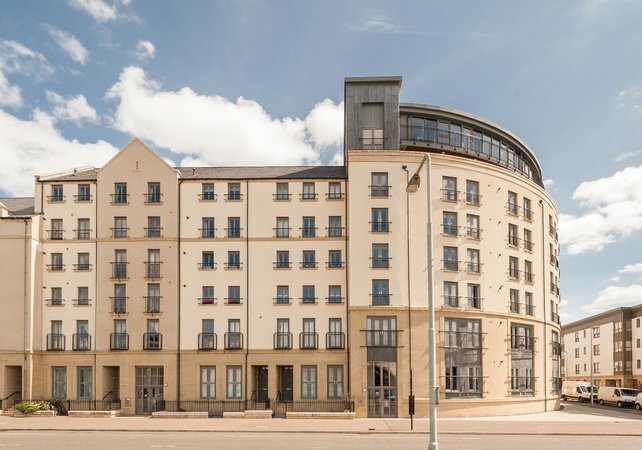 Cast your eye North through the windows and you’re treated to views of sleepy Newhaven Harbour and Lighthouse, the Firth of Forth, and the Forth Road and Rail Bridges. However, we appreciate that little ones might not be so enamoured with the spectacular views or interior aesthetics, and so a flat screen TV with Freeview, DVD player, iPod dock and unlimited WiFi should keep them entertained when all else fails. 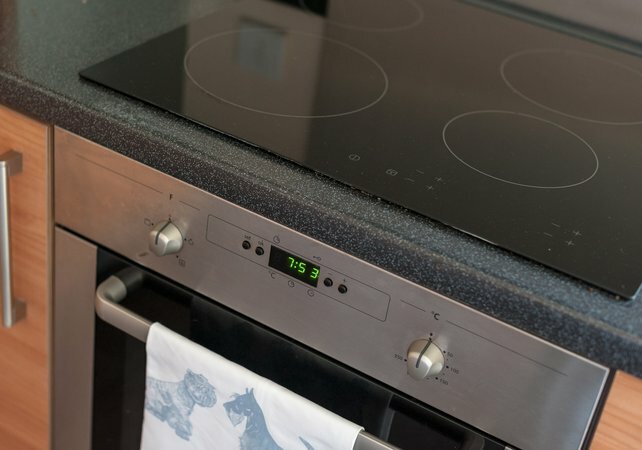 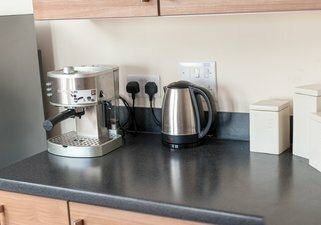 Moving through to the kitchen and dining area, you’ll find everything you need, including microwave, oven/hob, and coffee machine. An extra-large dining table allows for a banquet fit for a king, whether that be home-cooked or from a local takeaway (we recommend the critically acclaimed Britannia Spice, a fantastic curry house on Commercial Street) after all, you are on holiday! 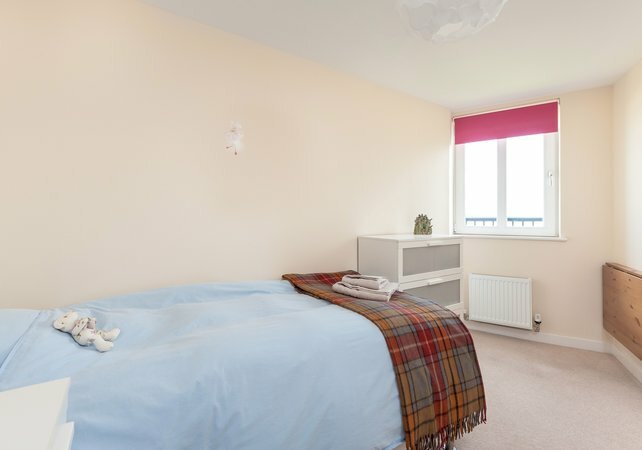 Indulge in some sweet dreams in one of three peaceful bedrooms. 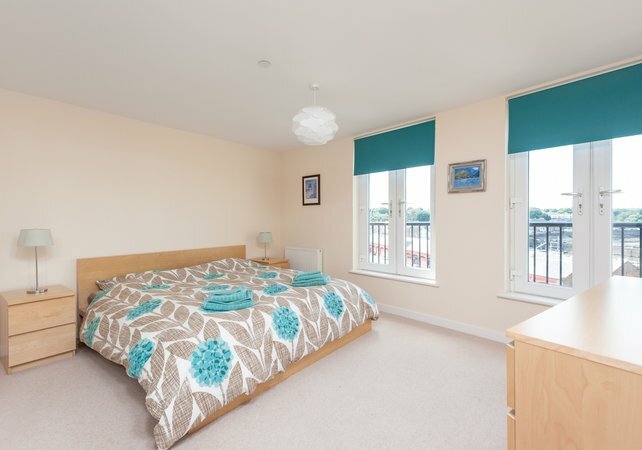 The master suite has a king size bed, large fitted wardrobes, en suite shower room, and more of those fantastic views. 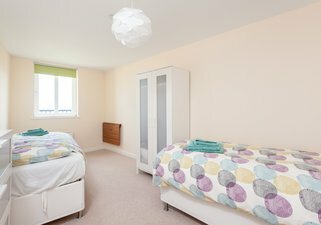 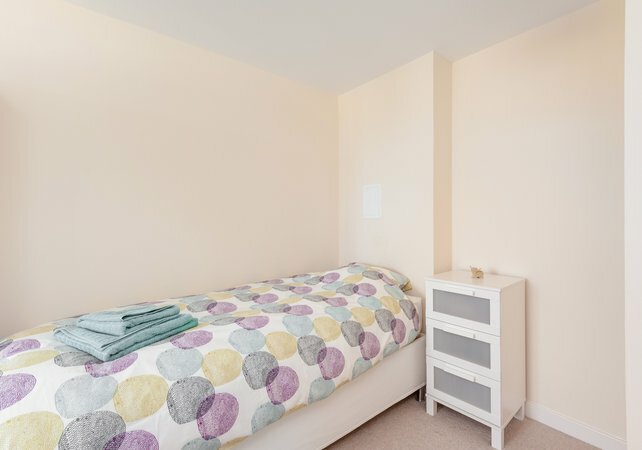 The second bedroom comprises single twin beds and plentiful storage, and a further bedroom sleeps a 5th guest in a single bed. 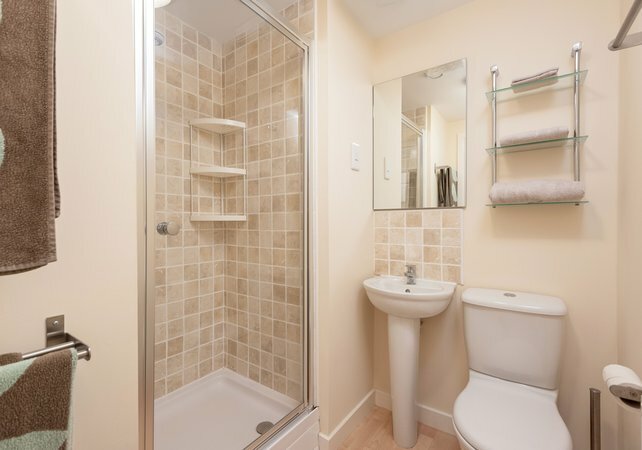 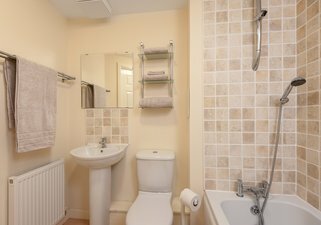 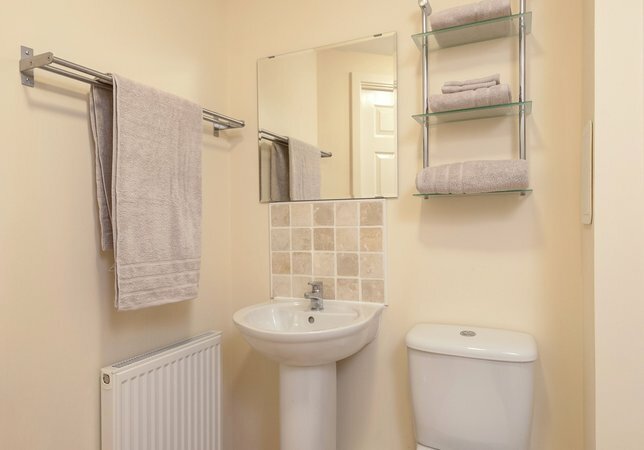 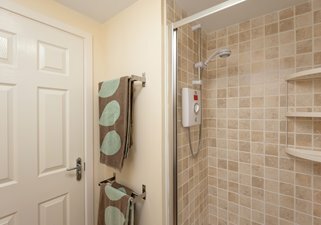 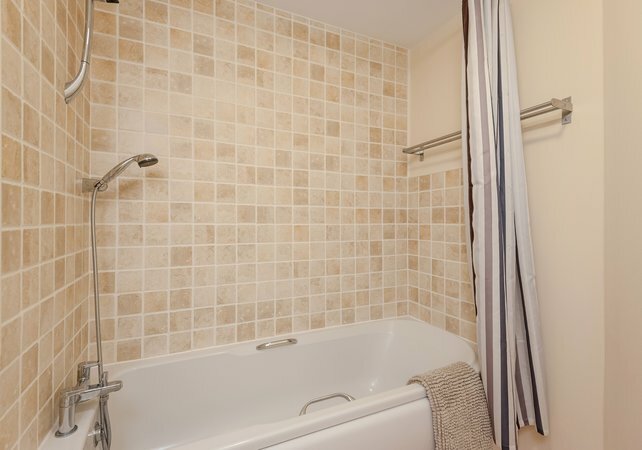 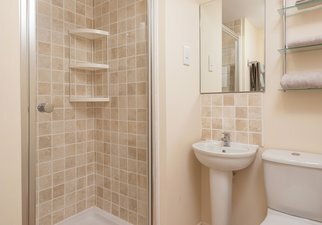 A family bathroom with shower over bath completes this lovely home from home. In terms of location, you are spoilt with the best of both worlds. 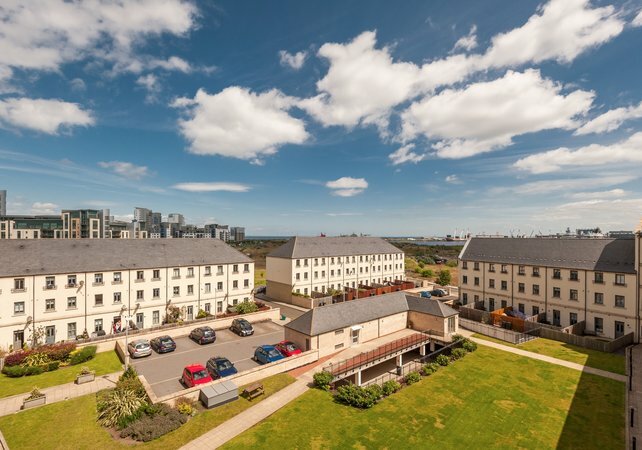 Ocean vistas and a quiet, shared garden provide a spot of tranquillity amidst the hustle and bustle of a city break, yet the hubbub of the city centre is also just a haggis’s throw away. 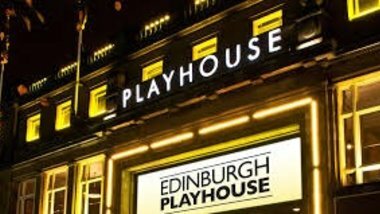 The Royal Mile and New and Old Towns are less than 3 miles, or a 15-minute drive away; and a bus stop right outside the front door is frequently serviced by the number 10 bus, which will whisk you in to town and back from 6am to midnight. 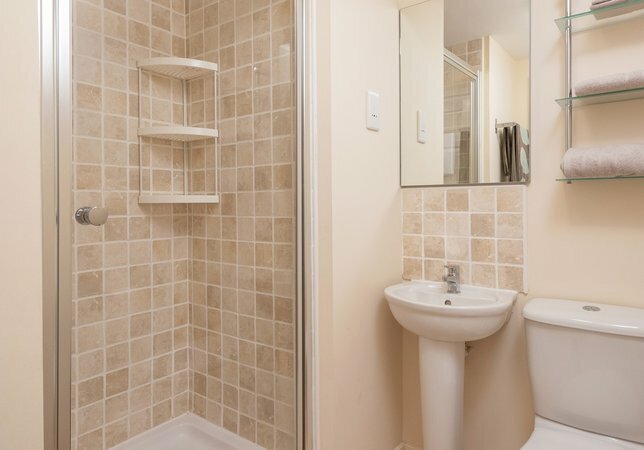 However, there’s also plenty to see and do almost right on your doorstop. 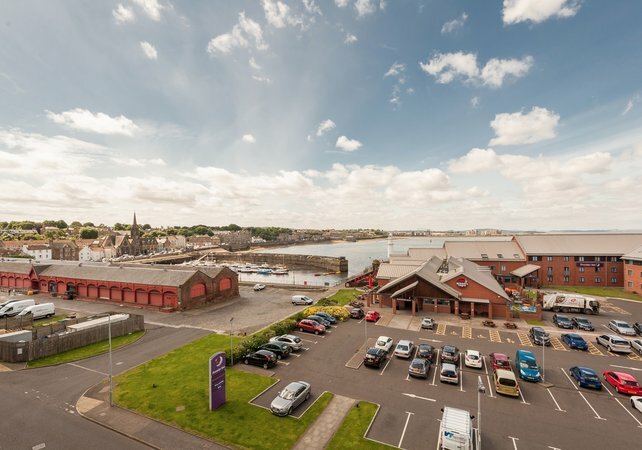 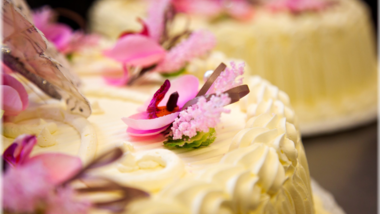 Three restaurants catering for all tastes and budgets are just outside of the apartment building at Newhaven Quay; Loch Fyne Seafood and Grill, Prezzo Italian, and Brewers Fayre. Or fancy something a little more glamourous? 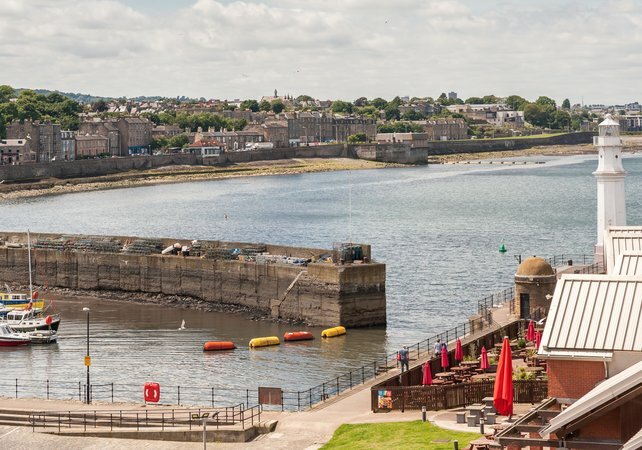 Then why not head just one mile down the road to The Shore, a cosmopolitan little area packed with bistros, cocktail bars and even a Michelin star or two. 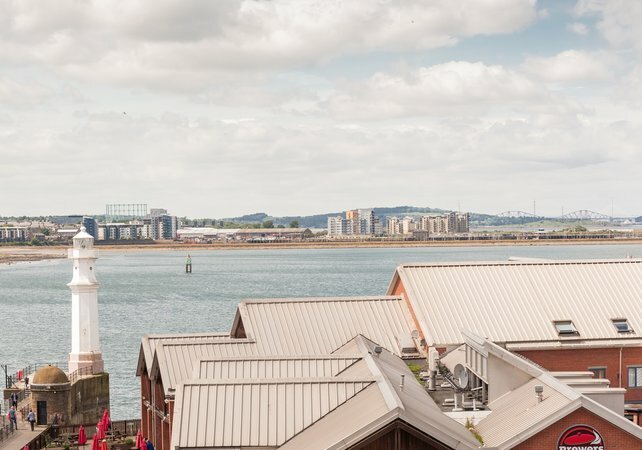 Rainy day paradise Ocean Terminal is also just around the corner and home to a cinema, gym, soft play, department and high street stores, and a great choice of family restaurants including Pizza Express and Wagamama. Permanently anchored next door to Ocean Terminal is The Royal Yacht Britannia, one of Edinburgh and the UK’s top attractions. 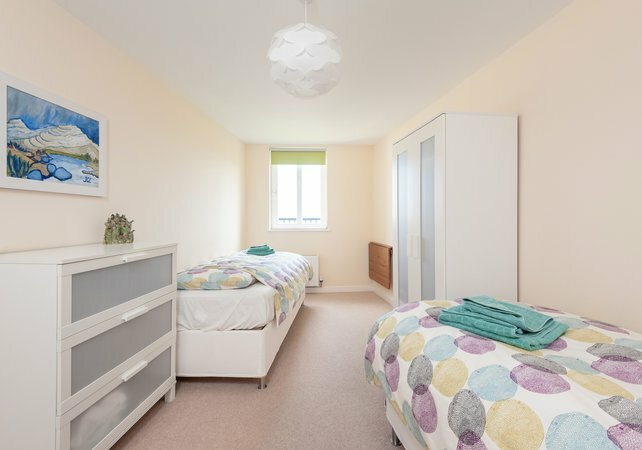 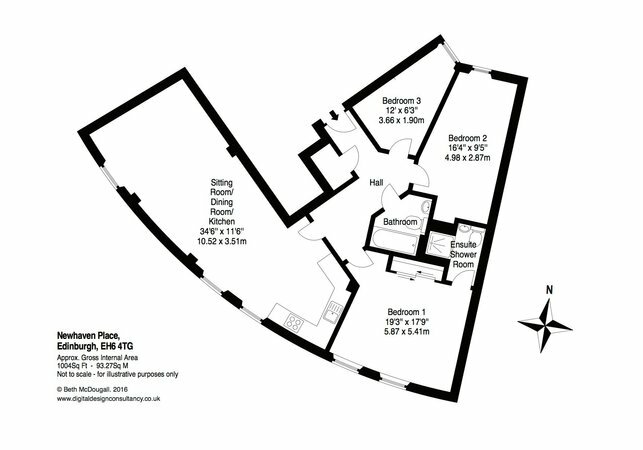 A central hallway leads to three bedrooms, one with en suite, a family bathroom, and an open plan kitchen/living/dining area.